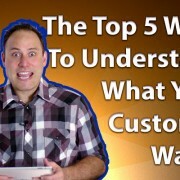 Hello David Judge here and today I’m going to discuss The Top 5 Ways To Understand What Your Customer Wants. Over my years in the Online Marketing arena I’ve watched the number of tools that have grown and adapted and seriously it is easier today to understand what your customer wants more than ever before. The amount of information you can gain about your customers using the internet is staggering. On the flip side, when I talk to business owners about the tools they use to measure client satisfaction at times I get this look like I’m asking them to explain the meaning of life. And you know this is great news as it means there’s a lot of opportunity out there to understand the hot buttons of your customers, how to sell them what they want and most importantly, get your previous customers to come back and buy more stuff from you. Last point (and then we’ll get into it)… when I researched this subject (as I wanted to see if there were any new trending ideas) the information out there is pretty light on so you’re really in for a treat. A survey is a way of directly connecting with your customer and asking them what they like and don’t like about buying from you. In a survey you can ask as many questions as you like with our research showing up to 6 questions getting the most people to complete. Also, when you conduct a survey, make it as easy as possible. I usually give the person 5 bullet points to choose from with an optional text block for them to complete more info. The best way to send? Email it to them! You can email it to them right after they buy from you, you can send them all out at once and you can even send them a few times a year. Surveys are BY FAR the most direct path to finding out what your customers want. Analytics lets you look at what your visitors are doing when they visit your website and or social pages. Google Analytics for example will tell you where a visitor comes from, how long they stay, the pages they look at and a heap of other important pieces of information. A good example of how you could use analytics would be to set up page on your website and send it out to for customers to look at. You could look at how many visited that page and place special ‘Calls To Action’ around that page and measure what they do. If you pay really close attention to analytics, especially after you make changes to certain pages on your website, you can see how people react to those changes. I am a HUGE fan of analytics as the first step to improvement is to first of all measure where you’re at first! Reviews and feedback can certainly go 2 ways, especially as people are more likely to leave a review if they are unhappy as opposed to happy. How do you fix this then??? You make it a process to ask every person to leave you a review which will allow you to gain a broader insight into what people like and would like to see improved. An example of this could be a shopping cart site where you could invite people to leave reviews after they’ve made a purchase asking the pros and cons of dealing with you. Whilst you may experience negative reviews if they are handled constructively, you’ll actually improve on a product, service and overall how they experience your business. No my preferred medium of finding out what my customer wants is through Facebook Ads. Why??? With facebook ads you can really drill down the people you would like to target, their age, gender, likes and dislikes and so much more. Facebook ads are also very cost effective at the moment, where you could gather a whole lot of important data from a well run ad for only $50. An example of how you could use paid ads would be to take a product or service and new ideas around how you would like to present that idea and to set up an ad for it. If you get bites, people like it, if you don’t then you need to tweak and repeat. This is a really good way for you to take a new product to the marketplace especially if you want get an insight on how your target market may react before you go LARGE. This one is HUGE and can give you a massive amount of information around what they do and how they do it. It doesn’t have to be in your local area, you can look countrywide, especially as there may be competitors further away that are really engaging in a way you could implement in your business. I mean seriously, what better way to understand what your customers want then to reverse engineer others. One last point on this last strategy… Make sure you focus on this from a ‘How I could apply this to my business and really focus on the areas that you can see attract the highest level of attention. Socially there are a lot of services you can use, for example Social Bro which allows you to measure your competitors Twitter accounts and which tweets gain the most traction, when they tweet and heaps of other cool info. Ok, that’s it. Remember as I said at the beginning the number of people out there actually investing the time to find out what their customers want are few and far between even though it makes so much sense to do it. By understanding what your customer wants you can get them to buy more of your stuff and in turn have more money to invest in getting new customers.. Make Sense???? Let’s wrap up… In the next video we’re going to talk about SEO penalties. We’re going to discuss what this actually means, the different types and the steps you need to start to reverse any penalties. Email Marketing is one of the MOST PROFITABLE methods for online marketing, yet is one of the most under used strategies for small to medium businesses. 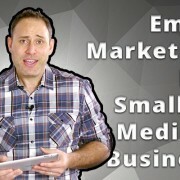 Hello and Welcome, David Judge here and Today I’m going to talk about why email marketing is important and how totally smash email marketing for your business. This is a really juicy subject so we’re going to get right into it. In my last video where I spoke about How Social You Should be in your business, I shared an interesting statistic that showed 86% of businesses that had an online marketing plan, used email marketing. What I find really surprising around this stat is when I conducted my own research of asking 212 business owners if they use email marketing, only 16% said yes and of those 34 businesses, only half sent emails with regularity. On top of that lets consider the saying that It costs 6–7 times more to acquire a new customer than retain an existing one. This statement that I just made was confirmed by Bain & Company in a survey of businesses. Now, off the top of your head, do you think if you were to send an email to existing customers, asking them to buy more of your stuff (the right way of course) that you could get them to come back? And based on the stats (6-7 times more to acquire a new customer) do you think it may be easier to get them to buy from you rather than get new customers? Starting to make sense? Cool! So lets go through now and look at the top 7 tips to email marketing that will help you to get more customers through your door! This means to make sure how a person can subscribe clear and simple to find. This can be on your website, email signature and social channels. Wherever I can find you online, I should see easily how I can subscribe to get more from you. If you are asking me to sign up, I want to know what’s in it for me, so make you give them a reason to give you their info. When I sent my very first email marketing campaign 14 years ago, I bought software that would sit on my computer. I would load all of my email addresses and tmy mailout and it would send one email after the next. I would have to manually remove my unsubscribes, my list and the whole process was painful and SLOW. Nowadays there are a lot of options where you may have an add-on as a part of your website. If you don’t have this you can use software like, MailChimp, Aweber, Get Response. Mailchimp is a Free option if you want to just ‘dip the toe’ and they allow you to send up to 12,000 emails per month and to store up to 2000 contacts Free. Yes, send them a welcome email. This lets them know you have received their contact details and if you’re really smart (using the software I mentioned above) you can set up what’s called an autoresponder sequence’. What’s an autoresponder sequence? This is a series of preset emails that you can send out to your new subscribers. You can have as many emails as you like and the reason auto responders are awesome is you can set how many and the time gap between each email. For example you could send 5 emails (that send automatically for you each spaced 1 week apart) that talk about other products or services you offer. This is just one example of endless opportunities, seriously. A template is essentially how your emails / newsletters would look. Each message you send that is coming from your business should have the same look to it and should reflect your overall branding. If you use one of the mail softwares I mentioned before, you can use one of their many templates which means a lot of the hard work here is done for you. All you have to do is add your headline to the top, your logo where you choose and what you’re going to send. I always like to include a special offer of some description with every email you send to your subscribers. An example… We arrange an email to a clients list of 2000 previous customers offering a Free Service (valued at $49.95) if they booked in for another product. The main product was $447 and the extra service took 5 mins and the cost on it was very low. We sent 3 emails to his subscribers over a 7 day period and he was booked out 1 month in advance. The moral of the story is not just that this worked really well, but also to really consider your offer and if it would get your target market to take ACTION. In other words, make your offer a fresh warm loaf of bread as opposed to a mouldy piece of toast. Like most online forms of marketing you need to have a plan. In reality when times get busy it’s really common to drop the activities that actually bring more money into your business, so If you have a schedule that you work on in advance you can delegate specific tasks which will ensure the ball keeps rolling. The stats are critical, especially as you want to understand what appeals to your subscribers. This will allow you to send them MORE of what they want which will in-turn make you more sales. Sound pretty simple right? As I mentioned, these stats are really important and when you combine these 7 tips together you are preparing yourself for massive success. Businesses are literally making millions of dollars a year by asking their customers to come back and by using exceptionally affordable methods just like email marketing make it a massive No-Brainer! Ok, great. in the next video we’re going to talk about the ‘Top 5 Online Marketing Strategies if you’re on a tight budget’. This is great for start up companies or if you want to do some online marketing, but don’t want to break the bank.